The Soviet era was a time of social and economic upheaval in Russia's history as the Bolsheviks strove to build a socialist utopia based on the theories of Karl Marx. Central to this endeavor was the 25-year dictatorship of Josef Stalin, whose determination to make the Soviet Union a dominant industrial and military power created misery on a grand scale and caused the deaths of millions of people.… Stalin arbitrarily invoked the specter of "e;enemies of the people"e; to destroy anyone who opposed the new socialist order. Millions of Soviet citizens were executed in continuous purges, and millions more perished in the slave labor camps of the Gulag. This book describes the fate of those citizens who were declared enemies of the people not because of what they had done but because of who they were. 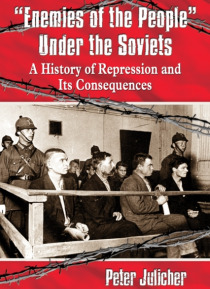 Stalin's repression not only destroyed the best and brightest, it prevented the development of a civil society in the Soviet Union which would have promoted economic justice, the rule of law and basic human rights for all.